Bazooka Bubble Gum in assorted flavors. You will get a box of 120 pieces of assorted bazooka bubble gum. Flavors are strawberry and tropical along with the original flavor bazooka. A flavor for everyone in the family. Although they have come out with new flavors, bazooka gum is still the same shape as the original bazooka and it stills comes with your favorite bazooka joe comics. 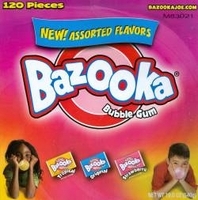 120 pieces of Bazooka assorted flavors bubble gum per box. Summer Camp I have a lot of nice memories involving candy. But one Stands out in my mind the most. When I was 10 yrs old, I was excited to go off for a week to summer bible camp. At the camp the kids were divided into 4 teams, the orange team, yellow team, green team, and the blue team. I was on the blue team. Teams would earn points by playing various sports and games. I was not really athletic, so I never felt I was any good at earning points for my team. UNTIL they announced that they would be having a bubble gum blowing contest. I was picked for the blue team, to compete against the other 3 teams, to brake the tie.... In front of 400 kids. I was soo nervous. They gave me a piece of watermelon bubble gum, and set the timer.. We had only 3 chances to create the biggest bubble gum bubble we could. I was soo nervous I thought for sure I blew it (no pun intended). And having never won anything in my life, my greatest moment as a child, I was announced the winner!!! For a kid with little self esteem, the applause was refreshing, and to top it off, the rest of the week, all the kids called me sugar lips. I have always thought of that is one of my fondest moments as a child. Select Flat Rate Option On Order Page. 48 States Ground Only. Wholesale Excluded. Please See Our Warm Weather Shipping Policy Here.